The greatest challenge in the life of any young, budding musician is always the same ~ carving out a niche and distinguishing his or her unique, individual talent. Although Jack Babineau, an 18 year old singer/song-writer/reincarnated blues belter FEELS that’s a challenge, one listen and you’ll be convinced otherwise. Having only been playing guitar for four and a half years, Babineau displays a talent and a passion beyond his years, and much of that natural insight and energy shines through inGeneration of Need, a collection of eight tracks recorded over two years. “The title of the album is the underlying factor. The whole album is about society, everything going on in the world and how we should stop pointing fingers and just try to better ourselves,” Babineau explains. His point is driven home with smooth, blues-infused pop riffs supported by his strikingly deep, shockingly soulful vocals. Babineau also had the help of some talented friends along the way. Rising R&B sensation Charise White contributed vocals on “Conformity,” “Love Now,” and “For Today,” while rock veteran James Montgomery, best known for his local blues and celebrity collabs with Kid Rock and Les Paul, to name a few. Catch Jack Babineau with his newly formed band Don't Blame Jack on tour this summer. In the meantime, head over to www.cdbaby.com to get your copy of Generation of Need, andwww.jackbabineau.com and www.myspace.com/jackbabineau to get a glimpse into this 18 year old, reincarnated bluesman. years ago and taught himself to play. played with the popular RI band, Rizzz. The Blackstone in Pawtucket at 7pm. Jack Babineau is a Smithfield, Rhode Island blues-rock veteran with multiple shows at the Gardner Ale House and the Bull Run in Shirley under his belt. At least I thought this until I read he hasn’t even graduated high school yet. Babineau’s age is irrelevant on his debut release, Generation of Need. He jams with New England blues dinosaur James Montgomery on one track, trading guitar licks with Montgomery’s sweet blues harp melodies like he’d been doing it for decades. Not bad for someone who learned to play five years ago. But the album really gains momentum during the title track. Babineau gets philosophical, asking what the human race did to “make it go so wrong.” He answers his own question seconds later in a burst of clavinet and electric guitar riffs: “money, lust and power, greed…create another generation of need.” Babineau is wise beyond his years on Generation of Need. myspace.com/jackbabineau. The 18-year-old singer-songwriter Jack Babineau manages to sound of his age and older than his age on his debut disc, “Generation of Need.” I wasn’t surprised to read on his bio thingy that his first musical goal was to learn to play a Dave Matthews song, and there’s more than a little John Mayer influence on the acoustic-dominated disc, but songs such as “Keep It On” betray classic rock and blues roots. Produced by Emerson Torrey and featuring guest appearances by James Montgomery and Charise White, it’s a promising beginning. A couple of months ago a friend gave me a CD that he’d been involved in. He asked for my feedback, with the unspoken hope that I would write something good about it on this blog. Because I respect his musical skill and sensibilities, I agreed to listen to it and give him my opinion, though I doubted I’d publish anything about it since his description as he handed me the CD (“kind of in the vein of Dave Matthews or Jack Johnson”) suggested that it wasn’t particularly my cup of tea music wise. Nevertheless, he assured me that it was quite good, especially given the tender age of the players, some of whom have a ways to go before they’re out of their teens. The CD in question was Generation of Need, by Jack Babineau, a young Rhode Island singer/songwriter. When I got down to listening to it, the Dave Matthews influence was evident right away, less so with the Jack Johnson sound. I did also hear some shades of Ben Harper (sans the gritty pedal steel) and John Mayer in the tracks. However, I was most struck by the maturity of the songwriting and the well-defined, sophisticated sound of the recording. Instruments are subtly interwoven, yet crisp and well-defined. Most songs are built around a foundation of layered guitars, starting with Babineau’s driving acoustic and the frequent interjection of electric guitars of various hues. Solid bass and surprisingly adept drumming (compelling, but not over-busy) flesh out the sound. Understated, but essential, keyboards add nuance and distinction to most of the tracks. Babineau’s lead vocals are band-leader worthy and effective in delivering his catchy and thoughtful lyrics. The song arrangements are tight and the playing is sharp throughout. But the secret weapons that really give this release a major label sound are the well-executed harmony vocals and the production – studio effects are adroitly employed, never over done. While the whole 30-minute CD is easy to enjoy, the standout tracks are the title track, a muscular song in which potent electric guitars are juxtaposed against an acoustic foundation; the funky “Love Now,” in which the soulful backing vocals and driving beat recall The Rolling Stones in their glory years; and “Keep It On,” which elicited some nostalgia for me, harkening back to the short-lived early 1990’s collection of local studio pros and an acoustic duo from Maine known as The Walkers (beneficiaries of Atlantic Records’ brief infatuation with New England bands at the time, which saw The Raindogs, Young Neal and The Vipers and The Walkers all signed to the label). So what I originally considered kind of an obligatory favor to a friend turned out to be an unexpected gift. I will continue to give Generation of Need the occasional spin in the CD player and keep an eye on what these young fellows do in the future with their budding talent and benevolent mentorship. 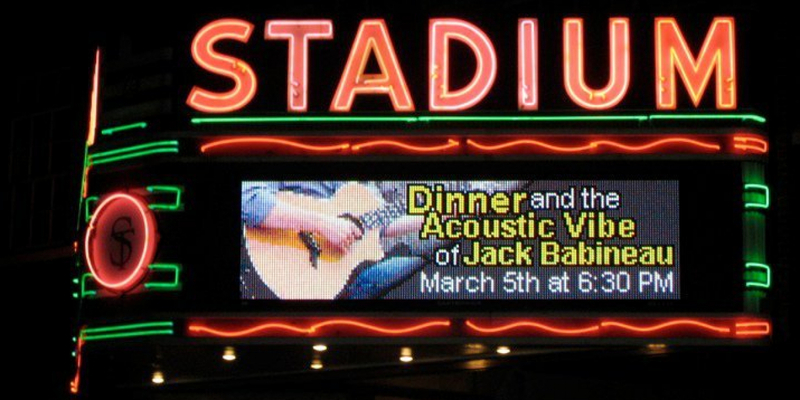 I've seen Jack perform several times, he captures his audience with not only his charm and cover songs but his original works are highly requested. "Love Now" is my favorite song from the cd, although all songs are sung from the Jack's heart & soul. Jack's music had been compared to Dave Matthews, but I think Jack is better! !